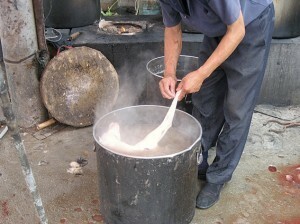 In 2008, One Voice conducted a survey in China on the dog meat industry. The way they live is a nightmare. China was preparing for the 2008 Olympics when One Voice investigators began their investigation. They had managed to infiltrate the network of the dog meat producers. At the risk of being arrested - or worse - if their true identity was discovered, they managed to gain the confidence of their guides and were able to film some particularly violent scenes. While the country was cleaning up Beijing and closing the restaurants selling dog meat, the investigators had uncovered a sinister reality. The conclusion of their investigation is without appeal: in China dogs are not "only" eaten, they are mistreated beyond all comprehension and put to death through unbelievable cruelty. Crammed into cages while they are still alive, deprived of water and food for days, they are sometimes fed with the flesh of other dogs to enhance the taste of their meat ... Among them, dogs with necklaces, probably abandoned by their owners, others come from specialized farms. In their eyes can be seen the sheer terror of their situation. Our investigators witnessed industrial killings, within the "production factories" but also on the sidewalk, in front of the specialty restaurants: live dogs wait at the entrance and are killed in public. There is no less violence here. 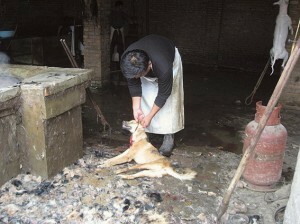 Before they are immersed in boiling water the dogs are beaten, knocked out with a club then disembowelled. They do not die straight away. In an atmosphere of growing panic they suffer for a long time under the gaze of their fellow captive companions. Faced with so much violence, more and more Chinese people are becoming indignant and are joining animal protection associations. The consumption of dog meat is decreasing but it is not enough. To help them obtain animal welfare laws in their country One Voice has launched a petition to the Chinese president: You can download and sign the petition on this website. The more we are, the stronger our voice will be! Support the One Voice campaign and please sign our petition to demand animal protection legislation in China.